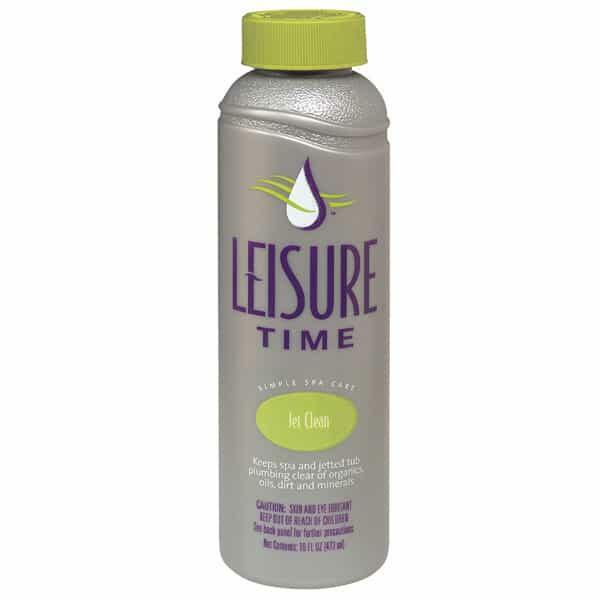 Jet Clean by Leisure Time is a concentrated formula that cleans hot tub and spa jets. It keeps your jets running regularly, free from blockage and other unwanted materials. With regular use, spa jets will accumulate organic materials, buildup, dirt, oil, blockage and more. If clogged, Jet Clean improves jet effectiveness and rids plumbing and jets of buildup. With regular use of the effective cleaning formula, your spa jets will be running as clearly and as strong as the first time you used them. Using Jet Clean is simple and effective. View instructions below, and call a Family Leisure spa chemical expert if you run into difficulty. Jetted bathtubs use 1/2 bottle. Run jets 15 minutes. Drain and rinse. Removes Organic Matter, Buildup, Dirt, Etc.